Our Lady of Guadalupe appeared to Juan Diego in Mexico. Read more Our Lady of Guadalupe here. She wore a very beautiful outfit, which can be hard to duplicate. My second oldest daughter has asked to be Our Lady of Guadalupe every year for the past 7 years! I finally felt I could do it! And she looks great! The pictures just don't to it justice!! 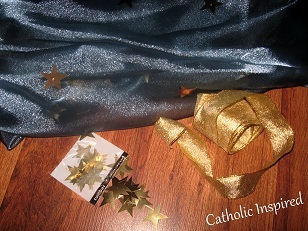 gold ribbon we created this shimmering veil! 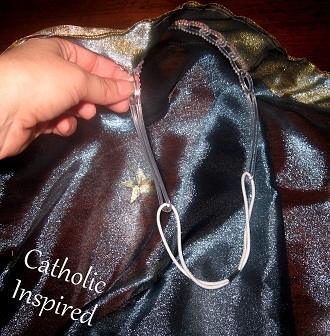 I sewed a headband to the inside of the veil so it would stay on her head better. Her dress is a rose colored, twin size bedsheet. 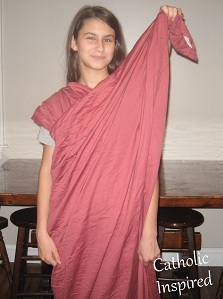 It's wrapped in a toga-like style. My daughter is about 5 feet 2 inches and this made a floor length gown on her. 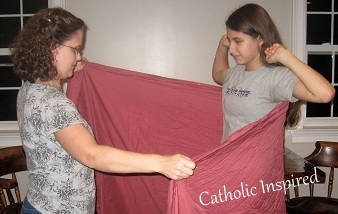 First, turn the sheet so the long side is horizontal. 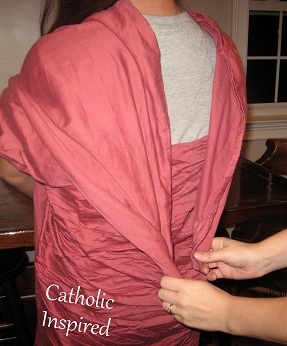 Then line the center of the sheet with the center of the wearer's back. 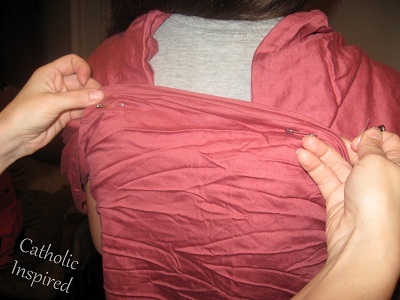 *********Drape one corner over the opposite shoulder. 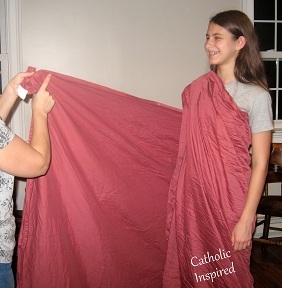 Then drape the other corner of the sheet over the other shoulder. You should have the two sheet corners behind the wearer's back. Tuck them in and safety pin them in place. Then fold the sheet down to cover the pins. I used more of the gold ribbon to tie around her waste. It's high above her hips like Our Lady's was. 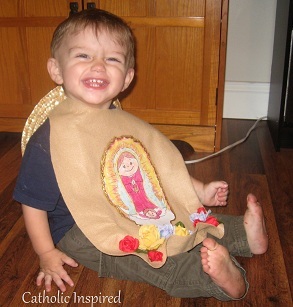 our little Juan Diego Costume, too. on how to make this costume. BEAUTIFUL JUST BEAUTIFUL!! THANK YOU!